Hatters midfielder Alan McCormack believes that his new team-mates will return for pre-season training absolutely determined to right the wrongs from last term. 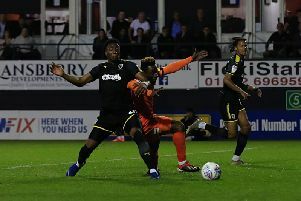 After being one of the favourites to go up, Hatters finished fourth and had to make do with a play-off spot, before going out to seventh-placed Blackpool over two legs, losing to the very last kick at Kenilworth Road. I’d be a little bit angered and little bit annoyed that another team that I don’t think was as good as us has managed to get promoted. When asked how he felt the squad would react, McCormack said: “If I’m thinking in terms of how I would think, I’d be itching to get back in, itching to get going again. “As I’d be a little bit angered and little bit annoyed that another team that I don’t think was as good as us has managed to get promoted. “That would make me want to prove it again next year, that we are the best team in the division, we should have been promoted and we just weren’t on the day. “Unfortunately that happens and sometimes disappointments in life makes you stronger as players. McCormack knows it will be far from easy with League Two now attracting some high calibre players though, adding: “All the divisions are very tough now, the filtration down the leagues, coming from the influx of the Premier League is making a lot of very good players, capable of playing in the Championship and League One, drop down to the lower divisions. “The talent you see in League Two is phenomenal, and the young lads coming through are getting coached very, very well, playing in front of crowds, against men. “So every team will have the same aspirations this year, have the same group of players that will want to get promoted.